Apple marketing chief Phil Schiller has publicly come to the defense of the $329 entry price of the iPad mini, saying he believes customers are willing to pay for quality that rivals like Amazon and Google don't offer. At $329, the iPad mini is more expensive than the $199 cost of the 16-gigabyte Amazon Kindle Fire HD, or the $249 16-gigabyte Google Nexus 7. But Schiller, Apple's senior vice president of Worldwide Product Marketing, told Reuters that he believes Apple's new 7.9-inch iPad mini is a superior product that earns its higher price point. "The iPad is far and away the most successful product in its category," Schiller said. "The most affordable product we've made so far was $399 and people were choosing that over those other devices. 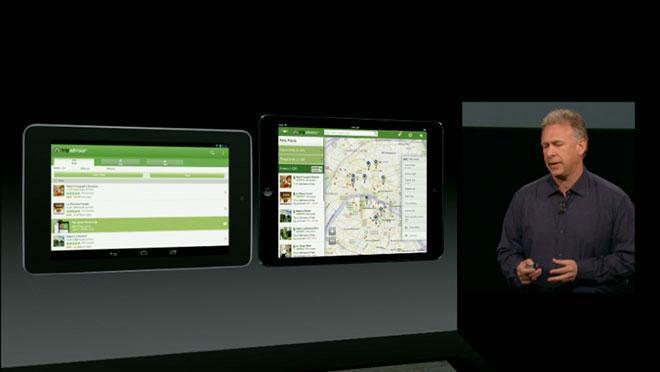 The Nexus 7 was specifically called out by Schiller during his presentation at Apple's iPad mini media event on Tuesday. There he made the case for Apple's 7.9-inch display with a 4:3 aspect ratio, which offers over a third larger display area than the 7-inch display on Google's tablet with a 16:9 aspect ratio. Schiller also noted that when Android controls are taken into account when browsing a website, the display area is 49 percent larger on the iPad mini in portrait mode than with the Nexus 7, and 67 percent larger in landscape mode. For their part, analysts on Wall Street generally agree with Schiller's sentiment, as most have indicated they believe the iPad mini will justify its $329 price to consumers. In particular, Apple's build quality, hardware performance, integrated software and strong application ecosystem are seen as key advantages over competitors like the Nexus 7 and Kindle Fire HD.